A new edition based on manuscripts and original editions (texts in English and Spanish). With this volume, 31 ORIGINAL PIECES Vol. V, Tárrega's original works are completed. It contains: Famous dances, Fantasíes, Varíations. 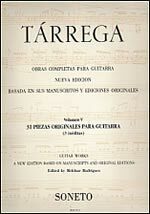 This part is the higher instrumental and interpretative level where Tárrega shows his great knowledge of the instrument as well with the dances as with the fantasies and variations. Using all the strum scales of the instrument, passing, as it is, his habit in all his tunes, through the most normal guitar techniques. When played, his pieces create a peculiar ambience characteristic of the atmosphere surrounding this instrument, passing in turn through the most natural technique that exists for the guitar.